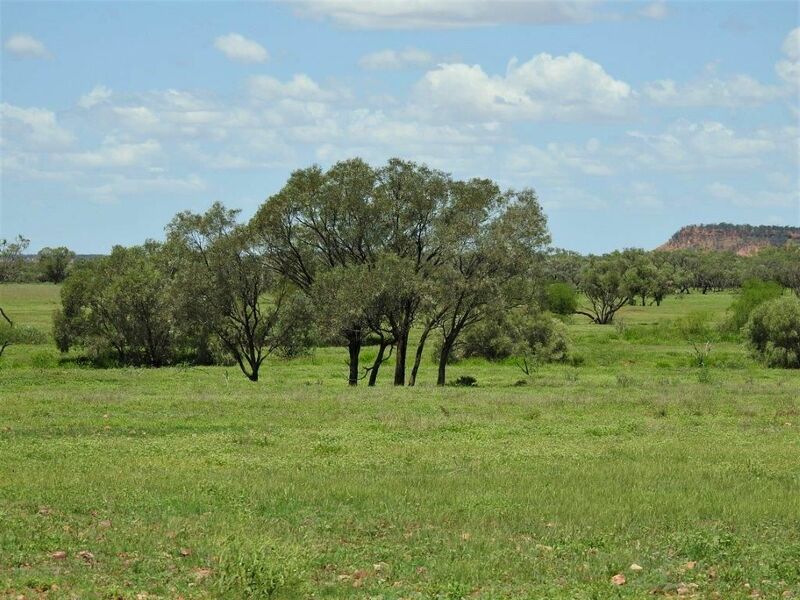 Agents Remarks:“Carisbrooke” can be used as a dual purpose sheep / cattle property for breeding, backgrounding or fattening. It has a very good mix of country that is sweet and quick responding. A tourism enterprise has been carried out on Carisbrooke for over 40 years and has contributed to the overall business.This is a great opportunity to purchase freehold country with a wide range of business prospects. Carisbrooke is beautiful, colourful country and frequently visited by tourist, artist and film crews. Carisbrooke is presently very lightly stocked and would be available for immediate livestock access after the signing of an unconditional sale contract. Carisbrooke would comfortably carry 600 cows or equivalent until the end of the year without further rain this summer. Location: There are two access roads to the Carisbrooke homestead. 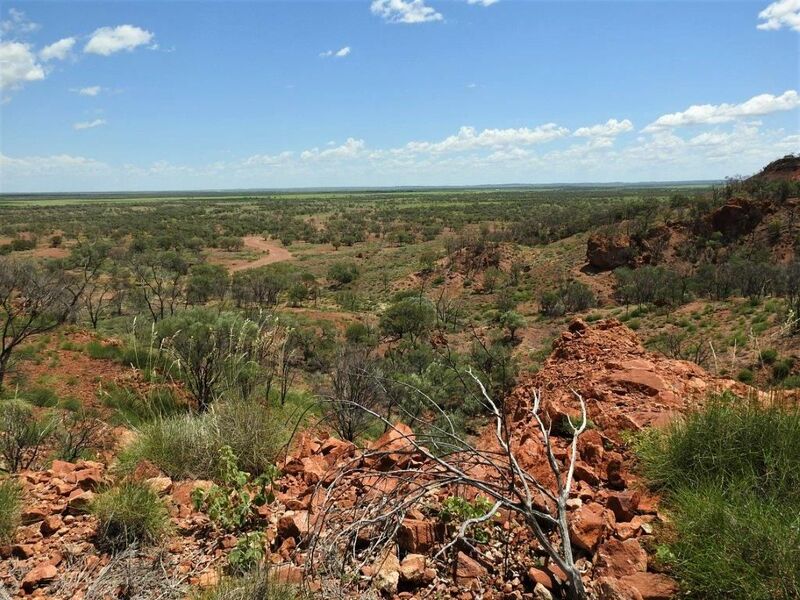 One is along the Winton to Boulia highway with 40 km of sealed surface and then down the Cork mail road for a total distance of 85 km. The second access is in from the Jundah road via a gazetted easement for a total of 75 km of which 50 km is sealed. 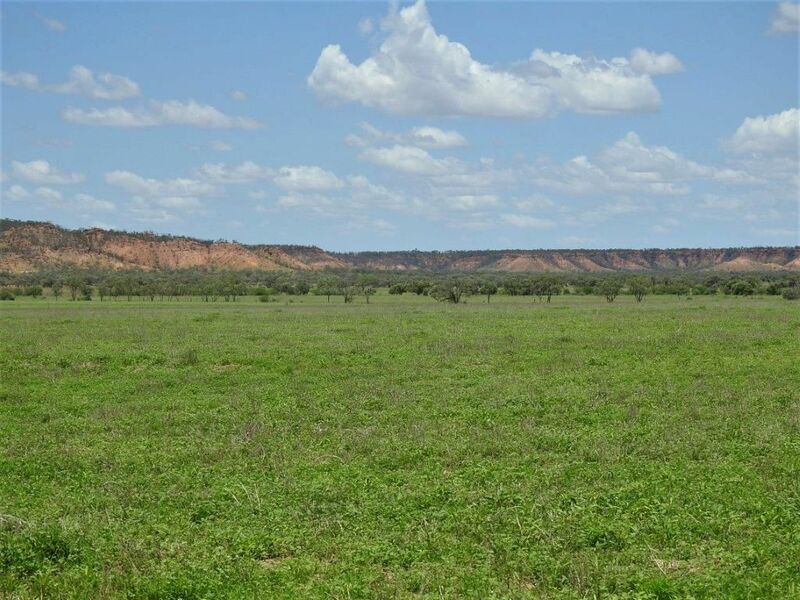 Facilities/Services: Rural power, telephone, broadband internet and a 900 metre airstrip. Winton offers primary and secondary schooling to grade 12, hospital and medical facilities, rural businesses, Government Agent and personal shopping. Twice weekly air services to and from Townsville and Brisbane as well as a daily bus service to and from Brisbane. There are cattle saleyards and rail trucking facilities in Winton. Rainfall: Average 12 inches per annum. 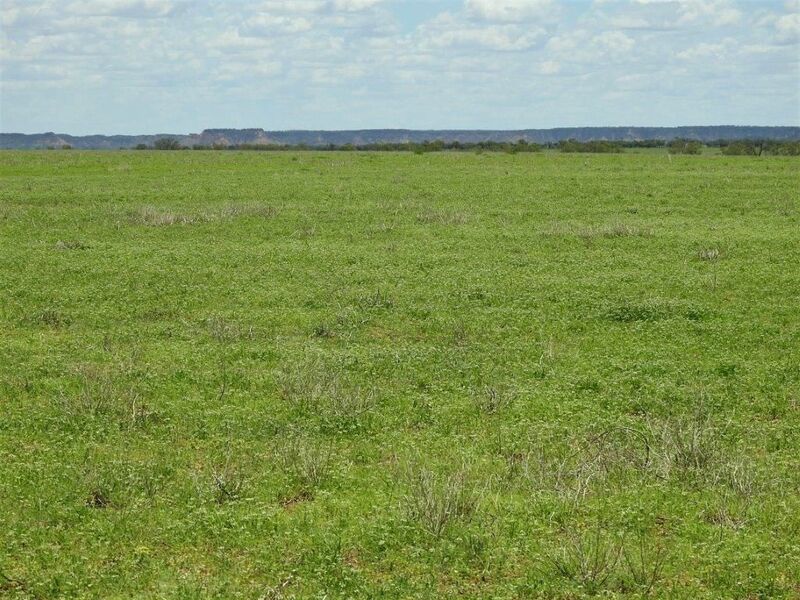 Carrying Capacity: 800 to 1000 dry cattle or sheep equivalent in an average season. 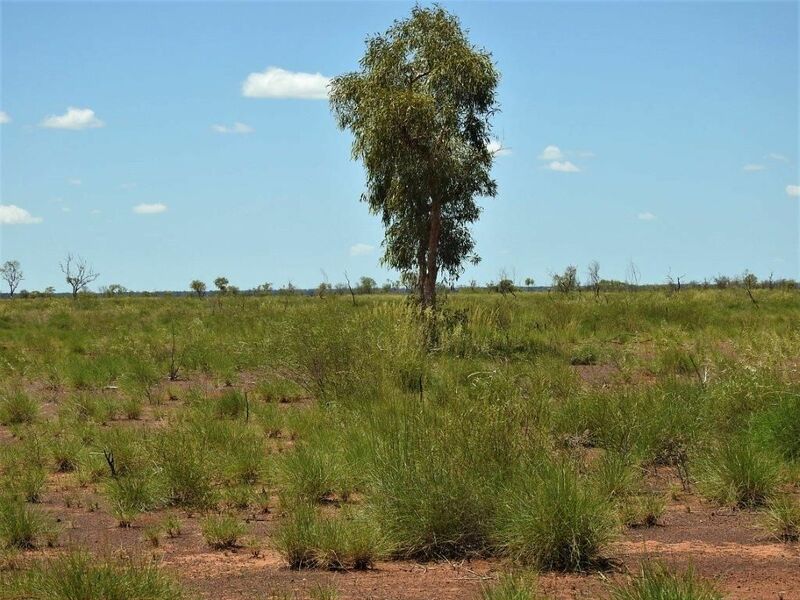 Country: Approximately 20,000 acres of Mitchell / Flinders grass pebbly downs, 12,000 acres of sweet Gidgee country with broken foothills; 10,000 acres of flood-out channels interspersed with clay pans and 8,000 acres of Spinifex tablelands. 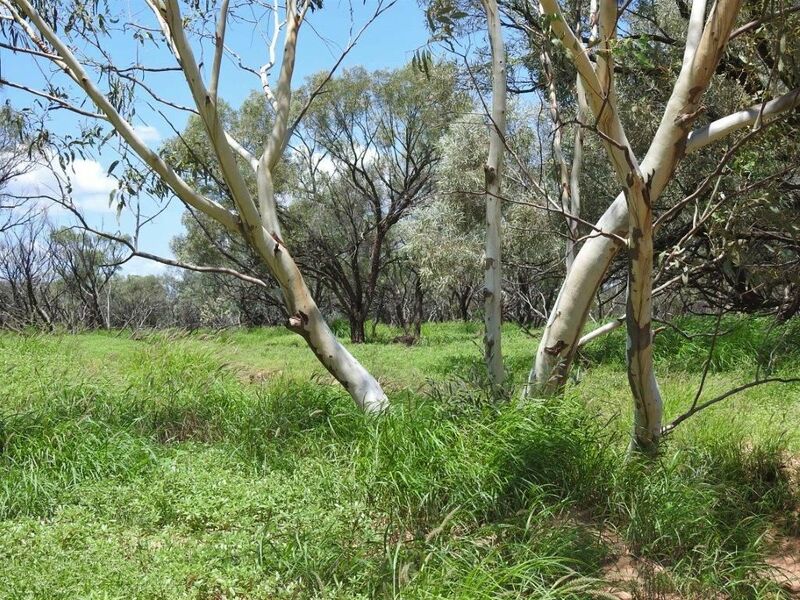 The downs country is lightly timbered with Whitewood, Vinetree and Gidyea with Coolibah along the channels and flood-out country. There is a scattering of Prickly Acacia across the downs and along some of the creek systems. 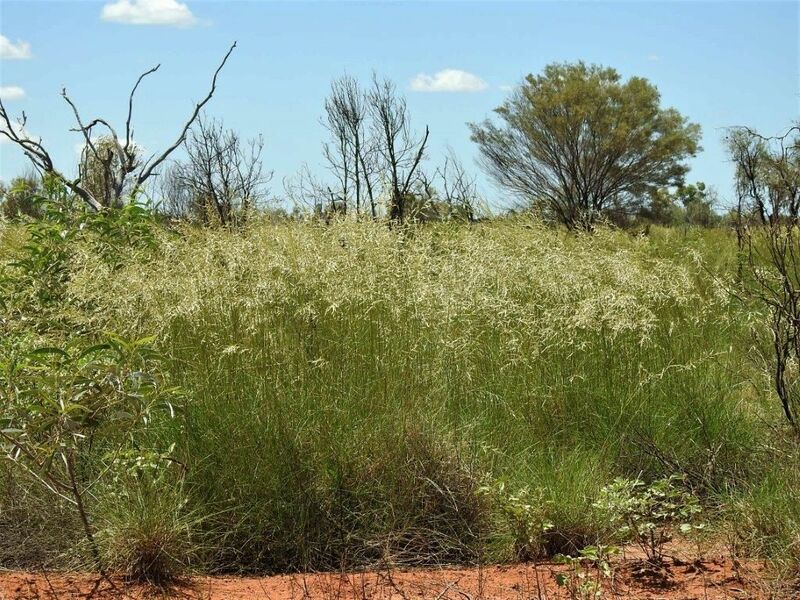 There is a good stand of Buffel grass along all the creek channels while summer herbages and button grass grows out on the clay pans and broken Gidyea country. Waters: The house bore is connected to rural power and is pumping from 145 feet with a submersible pump. There is approximately 9 km of 1.5 inch poly pipe connecting the house bore to Isles Dam, on to the Ridge turkey nest and then down to No 15 turkey nest, then on to the turkey nest near the Tranby boundary through a 1 inch poly pipe. The mill at William’s dam pumps through 1.5 inch poly pipe to the Ridge turkey nest as well. There are seven dams, three of which are equipped with mills, turkey nests and troughs. 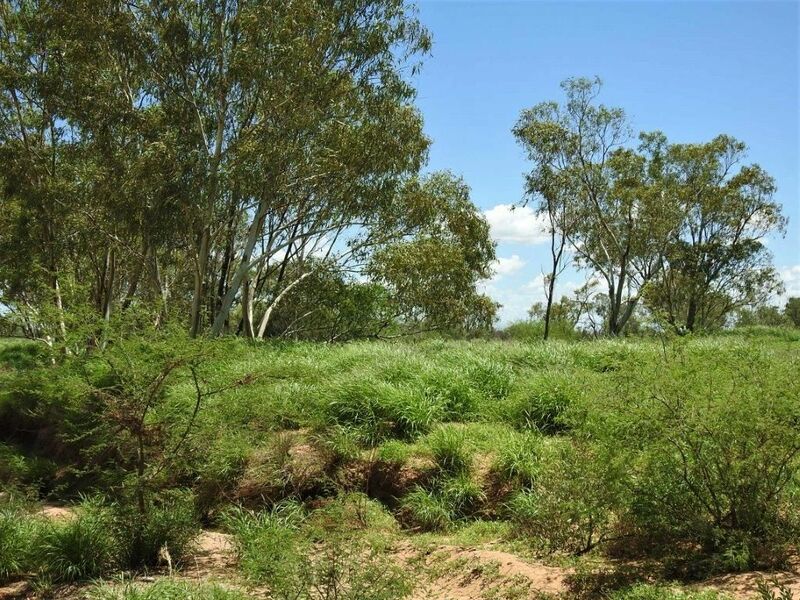 Carisbrooke is the site of what was Queensland’s first Keyline flood flow irrigation system. The two irrigation dams and part of the diversion channel system are in need of major repairs. 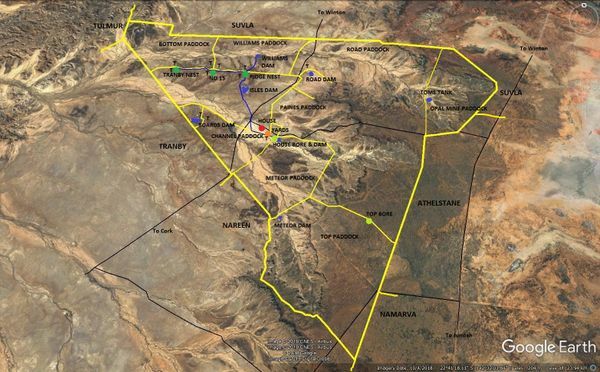 In their earlier days these two dams had an approximate capacity of 1900 mega litres that was supplied by 2 diversion channels of approximately 6 kilometres in length. A third diversion channel was partly completed. 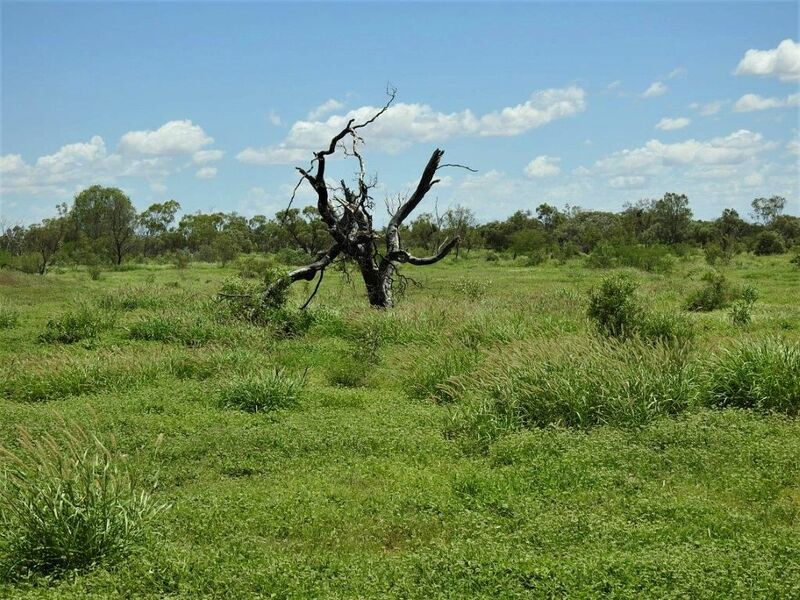 The old ‘key-line’ irrigation and water conservation system provided irrigation for 65 hectares of native and improved pastures for stock fattening. 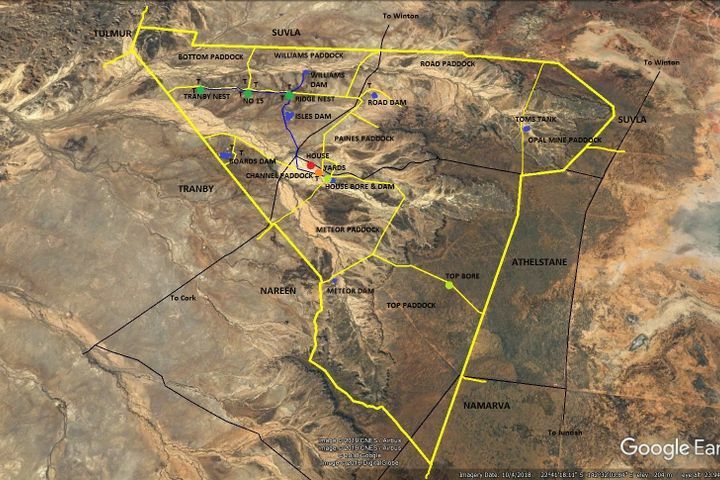 This system had enhanced water retention and pasture development on 400 hectares of land adjoining diversion channels. There is a Water Licence and a Diversion Channel Licence (No. 17468J) which is used to divert water whenever there is a run in Meteor Creek. 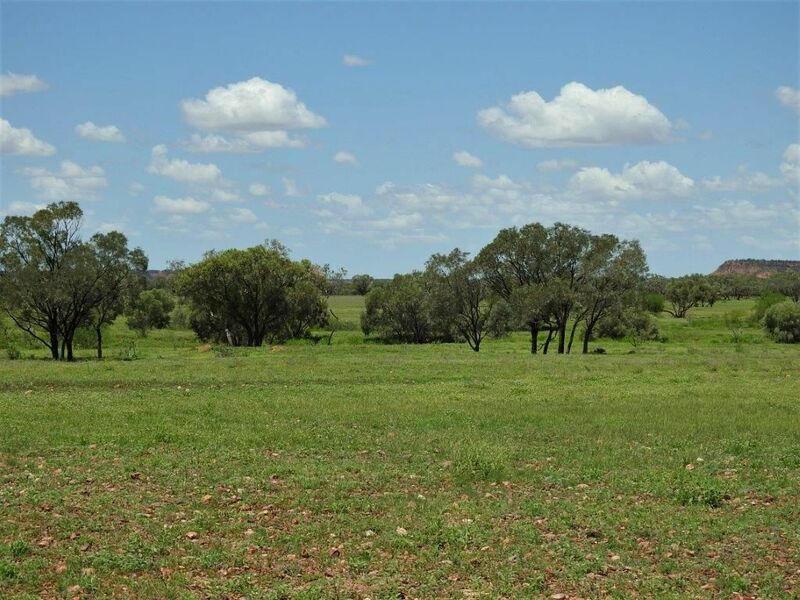 Fencing & Yards: Subdivided into nine main paddocks, two holding paddocks and two old irrigation paddocks. The boundary dog netting fence is mostly in good stock proof condition. The internal fences are of wooden and steel posts with mostly two barb and four plain wires or one barb and five plain wire. A small percentage of ring-lock fencing. 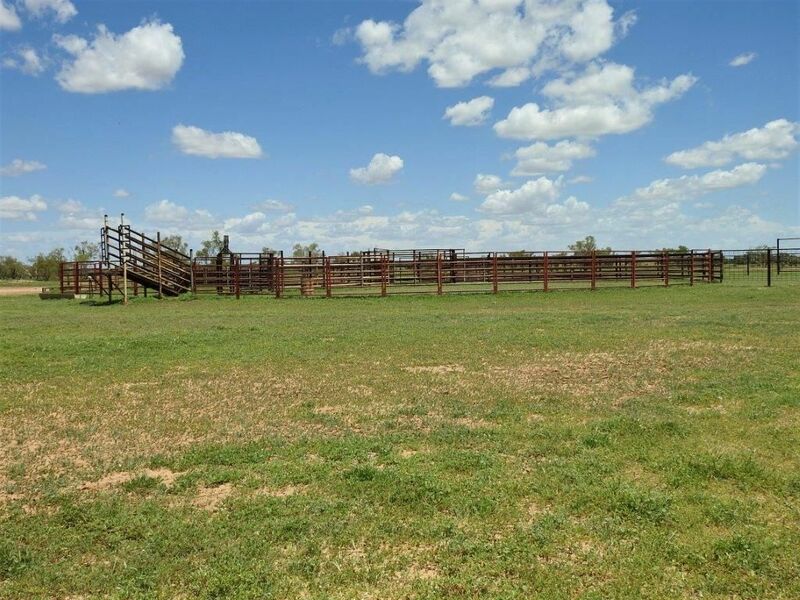 There is a set of steel cattle yards that are in very good condition with the capacity to handle approximately 400 head. There is also an old set of sheep yards. Improvements: The main homestead, of wooden and steel construction has four bedrooms, two bathrooms and enclosed verandas. The second homestead has four bedrooms and one bathroom. No one has been living in these buildings for over 5 years. There is a one bedroom cottage with kitchen, laundry and sleep-out on veranda. The quarters have four twin rooms and are self-contained and fully equipped. There is a 4 bay – 11M x 12M shed and a 6M x 9M workshop with cement floor. The 5 stand shearing shed with an 11M x 25M roof area is in very good condition and has the undercover storage area for 500 sheep. Tourism: There are approximately 40km of roads used for day tours which are suitable for all vehicles including full size tour coaches. 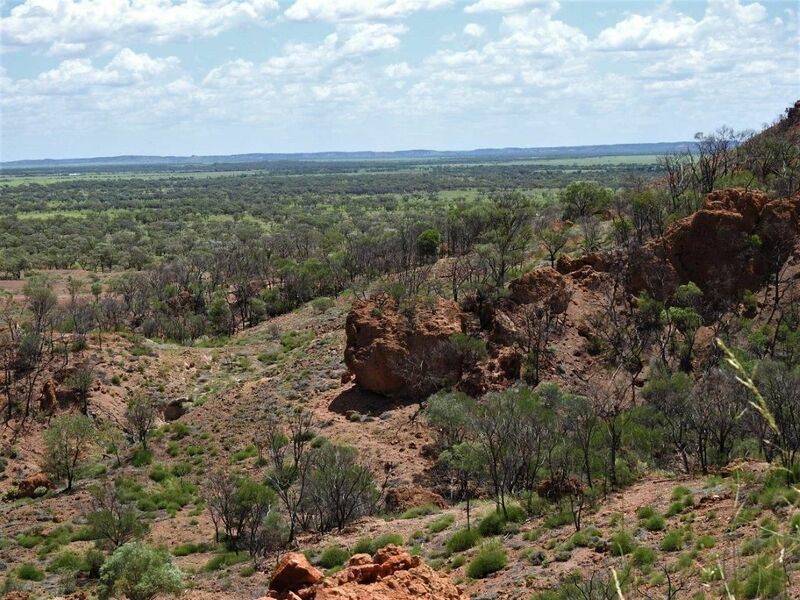 There are many scenic look-outs that are part of the most significant scenic attraction in the Longreach and Winton area, having hosted day tours and tourism visits since 1968. There are 4 major companies that have the right to conduct tours through Carisbrooke for the 2019 year. The access to Aboriginal sites is by conducted tours only. There are two demountable ablution buildings in Winton that will be relocated to Carisbrooke. 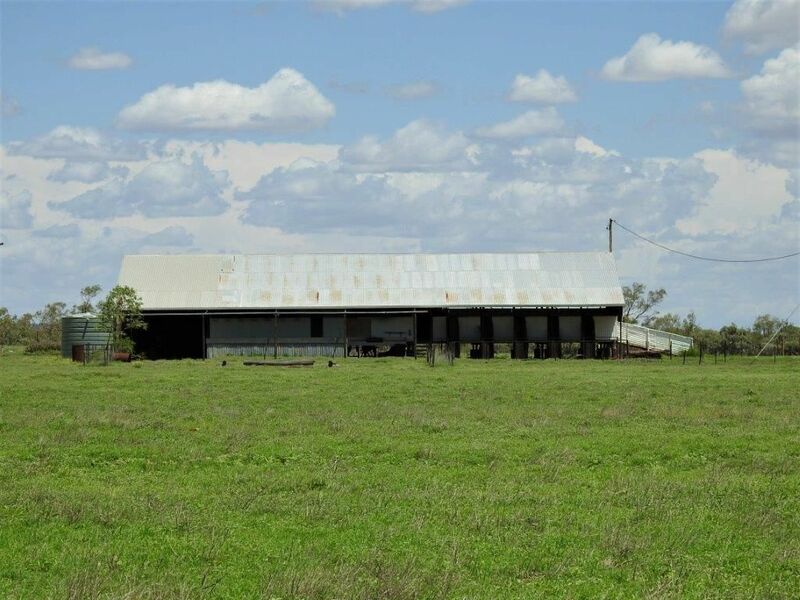 The shearing shed can be used for caravans and camping accommodation. Up to 2000 people per annum visit on organised tours, private vehicles or fly-ins. Carisbrooke was originally the Williams outstation of Bladensburg and was selected in 1936 by the Taylor family. There are Aboriginal art sites and an Aboriginal bora ring that are both in good original condition. Carisbrooke is also the site where the USA Airforce Flying Fortress successfully landed in 1942 with Lyndon Johnson and crew on board. 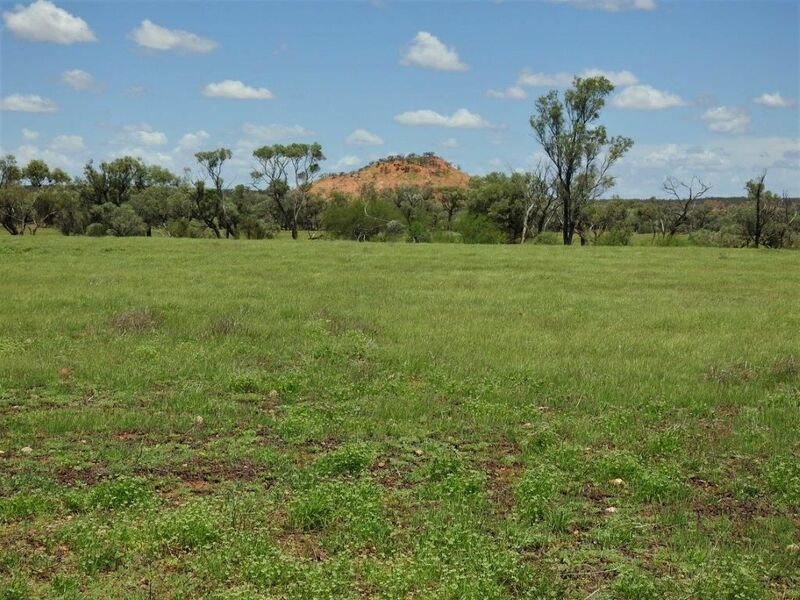 “Carisbrooke” can be used as a dual purpose sheep / cattle property for breeding, backgrounding or fattening. It has a very good mix of country that is sweet and quick responding. A tourism enterprise has been carried out on Carisbrooke for over 40 years and has contributed to the overall business. 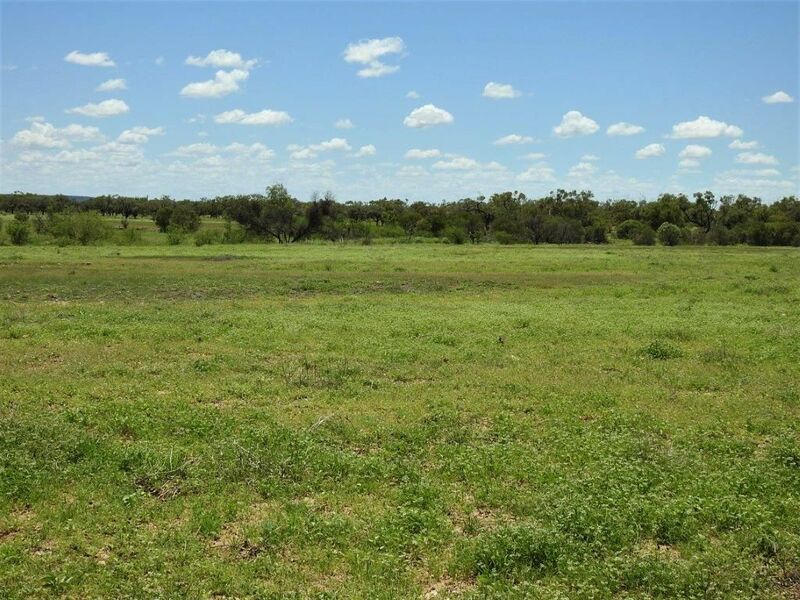 This is a great opportunity to purchase freehold country with a wide range of business prospects. Carisbrooke is beautiful, colourful country and frequently visited by tourist, artist and film crews. Carisbrooke is presently very lightly stocked and would be available for immediate livestock access after the signing of an unconditional sale contract. Carisbrooke would comfortably carry 600 cows or equivalent until the end of the year without further rain this summer. Just had over 150mm March 2019 ensuring a very good season. Disclaimer: The vendors and/or their agents do not give any warranty as to errors or omissions, if any, in these particulars, which they believe to be accurate when compiled. Prospective purchasers should satisfy themselves by inspection or otherwise as to the accuracy of the particulars. Please Note: The loan calculator is only indicative of monthly mortgage payments. Please Note: The Stamp Duty Calculator should only be used as a guide. For more information regarding Stamp Duties, please contact the appropriate Govt. Body in your state. Please Note: The loan calculator is only an indicative exchange rate.